Although a successful businessman, it soon became clear that Sculley did not know much about the computer industry. He and Jobs were at odds almost immediately. As the announcement of the Macintosh drew closer, Jobs went into hyperdrive. He worked hard to get developers to write programs for the upcoming machine--Jobs had realized that the Mac would ultimately be made or broken by the software industry. On January 22nd, 1984, during the third quarter of the Super Bowl, Apple aired its infamous 60 second commercial (13.4 MB) introducing the Macintosh. Directed by Ridley Scott, the Orwellian scene depicted the IBM world being shattered by a new machine. Initially, the Mac sold very well, but by Christmas of 1984, people were becoming fed up with its small amount of RAM, and lack of hard drive connectivity. It was around the beginning of 1985 that Jobs and Sculley began to argue. Sculley believed Jobs was dangerous and out of control; Jobs believed that Sculley knew nothing about the computer industry, and was making a poor effort to learn. In May of 1985 Jobs decided to make a play for control of the company. He enticed Sculley to schedule a meeting in China, and planned to stage a boardroom coup while Sculley was gone. At the last minute someone leaked the information to Sculley, and he decided to confront Jobs. After a heated argument between the two, the board took a vote, and sided unanimously with Sculley. 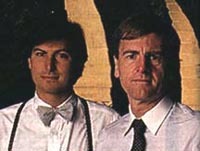 Jobs resigned that day, leaving Sculley as the head of Apple.